An eclipse is most glorious in the sky but a lot of other things happen around it. As it gets very close to total you will see the nature of the sunlight change and become quite eerie. Shadows of trees will turn into collections of crescents. About 20-60 seconds before and after totality, if you have a white sheet on the ground, you will see ripples of light waving, like on the bottom of a giant swimming pool. And the shadow. You will see it approach. If you are up on a mountain or in a plane this will be more obvious. It is going at 1,000 to 2,000 miles per hour. You will also see things like animals getting ready to go to bed as though it's night. All leading up to the big event. Don't spend too much time on them, but unless your eclipse is very short, look around. Notice it looks like sunset in every direction. Notice some of the stars and planets are visible to you. Notice a little about the people around you. Then get back to the eclipse. This is the tricky part. Just before the partial phase ends or starts again, there is a moment when the sun is 99.9% eclipsed and one or a few tiny spots of sun shine through. We call this the diamond ring, and I have included a picture. It's amazing. It is easy to see it when the eclipse ends, as this is how it ends. Seeing the starting diamond ring is more difficult, as you must time it right. The diamond ring is not perfectly safe to look at -- don't look at it in a telescope -- but it is OK to watch it for just a few seconds. And you should. For me, each time it has been obvious when to look away, but if in doubt, grasp it quickly and then avert your eyes. Or actually, what I do is close one eye and hold out my thumb and cover the bright spot -- and I then can watch the eclipse for another 10-20 seconds, as it is still there. The main reason the diamond ring is dangerous is you may think it's the most amazing thing you've ever seen and not look away when your senses tell you too. Be ready for that. Nobody is sure about this. There are eclipses every year or two, but other than a few, they have not taken place in rich areas where 100 million people have cars and live within driving distance. Where they are all on the internet being told about how great the eclipse is. Europe handled it in 1999, but who knows what the traffic will be the morning of the 21st. So if you are serious, sleep in the path the night before, don't expect to drive after sunrise. It might work. 95% it will work. But why risk it? On the other hand, you and everybody else will be checking online weather forecasts. If your chosen site is going to be cloudy, you will have to move. Traffic may limit your ability. Lucky people in planes will be able to move to airports in the path or even see it from the air. I chose my site based on the best weather odds, but now, 7 days out, there are no longer odds, but actual forecasts (though of low accuracy this far out.) So if you have not chosen your site, do it from the forecasts, not the odds. Be careful, the cooling effect of an eclipse (10 degree drop) can change the weather and cause clouds. Really, don't. I mean it. If this is your first eclipse, do not attempt to photograph it. Especially not with your cell phone, except as I tell you below. Nobody has ever made a photo of an eclipse that looks like an eclipse. You won't either. Don't waste your time trying. Since I am on Eclipse #6 I will photograph it, but I have the serious gear you need to do a decent job. And part of that gear is software to automate all the photos. I am going to set it up, adjust it about 5 minutes before totality and then leave it to the computers. (This means I need a clock drive to track the sun.) I will be watching. You can do some automated photography, too. Set up a video of you and your friends. The eclipse will be high in the sky so it may not be in it, and it doesn't have to be. Start the video well before totality and leave it be. Consider both fixed exposure video and auto exposure. Time lapses can also be cool -- but perhaps just shoot video and turn that into a time lapse for the partial phases and regular speed for total. Eclipsedroid can also be programmed to take photos at the special times in the eclipse with your phone -- but put your phone in a tripod or clamp phone holder and leave it to do the work. I took some decent photos of my 4th eclipse and the story of how we got to Enewetak, site of the first hydrogen bomb, is a cool one too. But I mistakenly wasted a lot of my 2nd eclipse photographing it. Don't be me! I did not photograph my first eclipse in 1991 -- but you can see the T-shirt I designed and sold for it. With that and buttons I paid for my eclipse expedition! 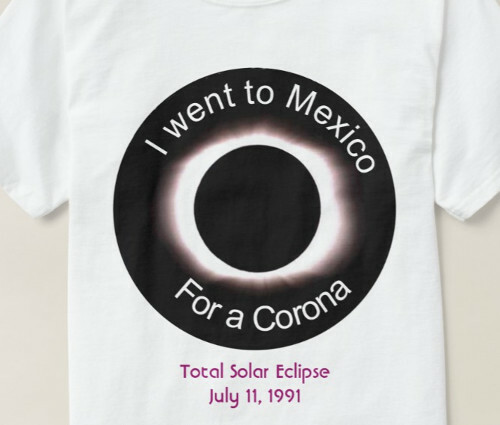 Oddly, Corona beer had an eclipse T-shirt but it did not clue into the pun at all. Don't check it once you are 2 minutes from eclipse. Set it and forget it. Also note that autoexposure may not be your friend. First, it takes away the great change of "day and night" that an eclipse represents. Secondly, most cameras tend to vastly overexpose the corona. So you get a fuzzy black circle covered by a big overexposed white blob with some streamers off of it. Looks even less like an eclipse than most photos. This is what you will get if you try to take a photo of yourself or friends with the eclipse behind you. What if I get clouded out? It happens, though often you see parts of the eclipse through the clouds, just as you see the full moon through them. But while a total eclipse is the most amazing thing there is to see on the Earth, and a cloudy eclipse is a very poor substitute by comparison, a cloudy eclipse is still a pretty cool thing to see. While I would not travel the globe to see an eclipse under clouds, or an annular eclipse (which is one where the moon is too small to make it total, so it's a very special 99% partial) I would travel a modest distance to see the world get dark in the most curious way. So go, even if it's cloudy. I have heard many people who, never having seen a clear total one, claim they were quite pleased with the cloudy total they saw. It is an amazing coincidence that the angular sizes of the Moon and Sun are almost exactly the same. (Since the Moon's orbit is elliptical, sometimes it is farther away and looks slightly smaller than the Sun---resulting in an annular eclipse---and sometimes it is closer and looks slightly larger (but not enough to obscure the corona, so still a proper total solar eclipse).) As far as I know, there is no explanation for this. Also, since the Moon is moving away from the Earth (conservation of angular momentum: it counteracts the slowing down of the Earth due to tidal friction), a total solar eclipse is possible at all only during a relatively short phase in the life of the Earth. If you agree with Brad that it "is by far the most spectacular natural phenomenon visible on this planet", then this makes it even more astounding. The moon and Earth are much closer in size than any other such pair known. In fact, astronomers sometimes think our system would better be called a "double planet" though to be fair, the central point that both orbit about is inside the Earth, about 3,000 miles from the center. If it were a little higher there would be no doubt it's a double planet. Not that we know about a lot of double planets. Eclipses do happen on Jupiter, you can see them, actually, as black spots that cross its surface. However, the spots are large, and as such the eclipses much less interesting. And of course, a lunar eclipse from the Earth is a solar eclipse if you are standing on the moon. NASA made a simulation of such an eclipse and it actually looks pretty cool, but not as cool as a matched eclipse. It seems we have never had a camera at the moon when one of these is happening as I can't find a real picture. Of course, every satellite that goes into darkness gets something like this, but close to the Earth (ie. ISS) the atmosphere would diffuse a lot of it. That is the key. After all, every sunset is an eclipse, but the atmosphere of Earth is so bright you can't see the atmosphere of the sun or any other cool things close to it. There was a famous science fiction story decades ago that imagined our situation was so unusual there are probably alien tourists at your eclipse site. Disguised as humans of course. Asimov wrote a boot about the Earth-Moon system called The Double Planet. The relatively large size of the Moon also plays a role in one of his works of fiction. It is true that "the central point that both orbit about is inside the Earth", but on the other hand the orbit of the Moon is concave with respect to the Sun. The Earth-to-Moon mass ration is 81:1, much smaller than for other satellites (except Pluto and Charon, but of course Pluto is not a planet :-) ), but not small enough to really suggest a double planet. Yes, it is mostly luck, as far as I know.